Contributions to a Solo 401k plan must be made by your business tax return due date plus extensions. The self-directed 401k contribution deadlines are driven by the type of entity sponsoring the self-directed solo 401k. If the entity type is a Sole Proprietorship, the annual solo 401k contribution deadline is April 15, or October 15 if tax return extension is filed. If the entity type is an LLC taxed as an S-Corporation (calendar year), the annual solo 401k contribution deadline is March 15, or September 15 if tax return extension is filed. If the entity type is an LLC taxed as a Partnership (calendar year), the annual solo 401k contribution deadline is March 15, or September 15 if tax return extension is filed. If the entity type is an LLC taxed as a Sole Proprietorship, the annual solo 401k contribution deadline is April 15, or October 15 if tax return extension is filed. 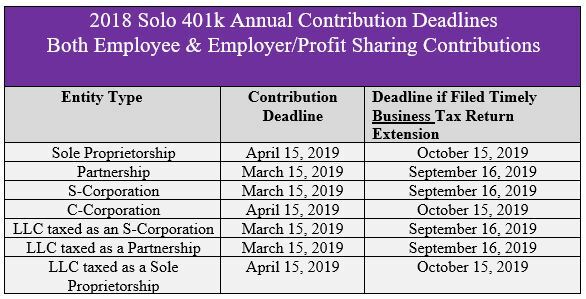 If the entity type is a Partnership (calendar year), the annual solo 401k contribution deadline is March 15, or September 15 if tax return extension is filed. If the entity type is an S-Corporation (calendar year), the annual solo 401k contribution deadline is March 15, or September 15 if tax return extension is filed. If the entity type is an C-Corporation (calendar year), the annual solo 401k contribution deadline is April 15, or October 15 if tax return extension is filed. John Doe’s self-employed business is a calendar year S-corporation having a tax filing deadline of March 15; however, John timely files tax return extension, so he has until September 15 to make his Solo 401k contribution. The annual solo 401k contribution limits as affected by the type of entity sponsoring the solo 401k plan. If the entity type is a Sole Proprietor, the starting figure for calculating the annual solo 401k contribution is line 31 of Schedule C.
If the entity type is a C-Corporation, the starting figure for calculating the annual solo 401k contribution is W-2 income. If the entity type is an S-Corporation, the starting figure for calculating the annual solo 401k contribution is W-2 income. If the entity type is a Partnership, the starting figure for calculating the annual solo 401k contribution is Schedule K of Form 1065 line 14. In order to make contributions to a Solo 401k, the IRS Solo 401k regulations require that you open Solo 401k by December 31, 2014. This does not mean the Solo 401k checkbook control account has to be opened by 12/31/2014, rather that the Solo 401k documents (Solo 401k Adoption Agreement, etc.) are executed by 12/31/2014. Example: Mark Wayne who is self-employed and business type is a Sole Proprietor wants to Open Solo 401k so that he can make Solo tax-deductible contributions for 2014 tax year by April 15, 2015; therefore, Mark must sign the Solo 401k plan establishment documents (Solo 4014k adoption agreement, etc.) by December 31, 2014, but can wait until April 15, 2015 to open the solo 401k bank account(s). Solo 401k loan payments are due either monthly or quarterly, determined at time of initial Solo 401k loan issuance. However, a grace period is available for missed payment. The grace period calls for the late payment to be made by the last day of the quarter (3 month) following the quarter in which the loan payment was due. Example: On January 23 Jane Doe processed a Solo 401k loan amount of $20,000 having 15 year term. Since Jane is using the borrowed funds towards the purchase of her primary residence, the Solo 401k participant loan can exceed the standard 5 year period. Further, Solo 401k loan is payable monthly with the first fixed loan payment amount of $370 due on February 23. Therefore, if Jane is unable to make her scheduled loan payment by the February 23 due date, which is the first quarter, Jane must make the missed payment by June 30, which is the last day of the quarter following the quarter in which the missed loan payment was due. The Solo 401k business owner in conjunction with the Solo 401k provider may have to file an annual return/report form by the last day of the 7th month after the Solo 401k plan year ends. Form 5500-EZ is used by the self-employed business owner to report on a yearly basis the total value of the Solo 401k plan; however, Form 5500-EZ does not need be filed until the Solo 401k plan total assets exceed $250,000. Lastly, all Solo 401k Plans must file a Form 5500-EZ for the final plan year to show that all plan assets have been distributed. CLICK HERE to read our FAQ page on Form 5500-EZ. Anytime a plan participant or beneficiary takes a distribution from his or her self-directed solo 401k, IRS reporting requirements apply. 1099-R reporting also applies to in-plan Roth 401k conversions. Payers must send a Form 1099-R, Distributions From Pensions, Annuities, Retirement or Profit-Sharing Plans, IRAs, Insurance Contracts, etc., to the IRS and to the individual receiving the distribution. The form is due to the IRS by February 28. The solo 401k plan provider is responsible for updating the plan for any required IRS changes, with the next required update occurring in 2020. You will be required to sign all new solo 401k plan documents, and only the solo 401k plan provider can handle such update with the IRS.